Time to transplant or repot your Nepenthes? You’ve come to the right place! 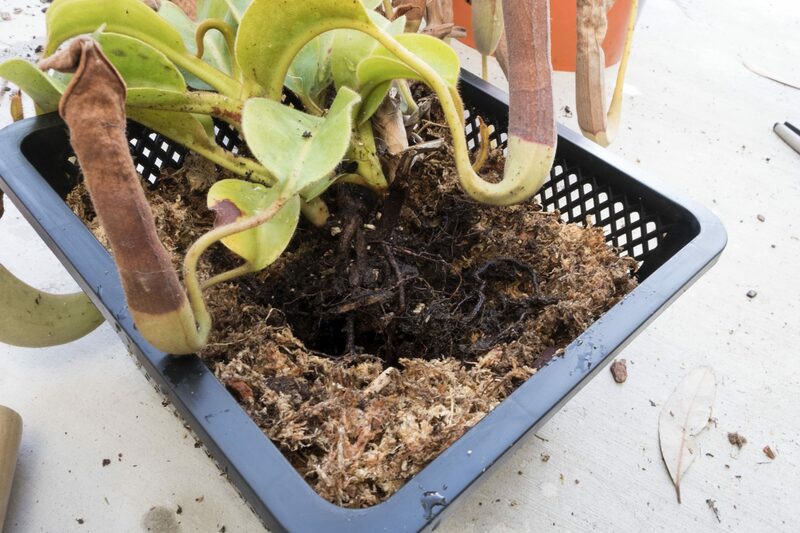 In this post, we’ll cover the do’s and don’ts of taking that tropical pitcher plant and building it a cozy new home where it will thrive for years to come. 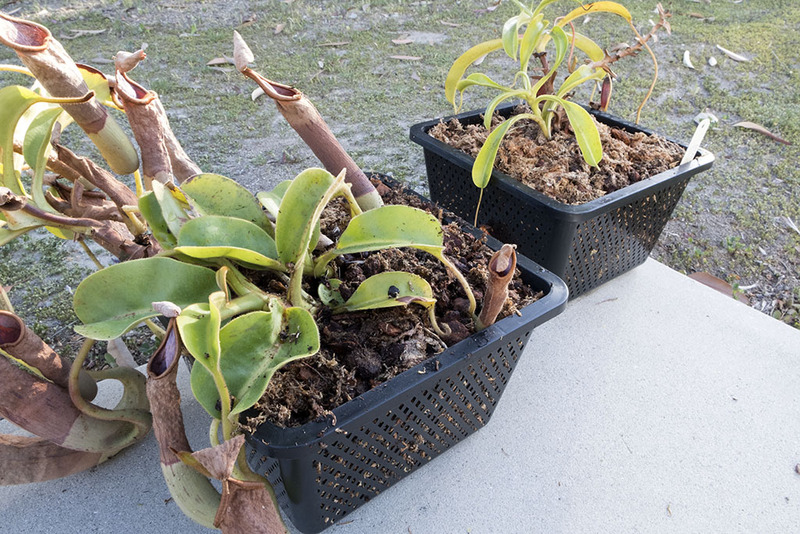 While Nepenthes pitcher plants tend to be more finicky than Sarracenia pitcher plants, transplanting actually requires fewer steps and, in my opinion, is easier than transplanting Sarracenia. 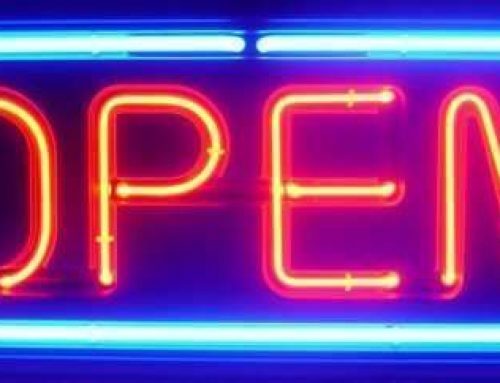 So, read through these instructions in full, prepare your materials, carve out an hour of time in your busy weekend, and have fun getting your hands dirty! Nepenthes usually have relatively small/shallow root systems, so they only tend to get root bound in smaller pots. That said, soil does compact, get old, and start to decompose. This can result in too much moisture retention, and a lack of soil aeration encourages unhealthy bacteria and can stunt or rot roots. A fresh batch of soil is like a new pair of running shoes – comfortable, odorless, and encouraging of healthy behaviors.Also, once weeds grab hold in a growing area, it can be near-impossible to get rid of them all. 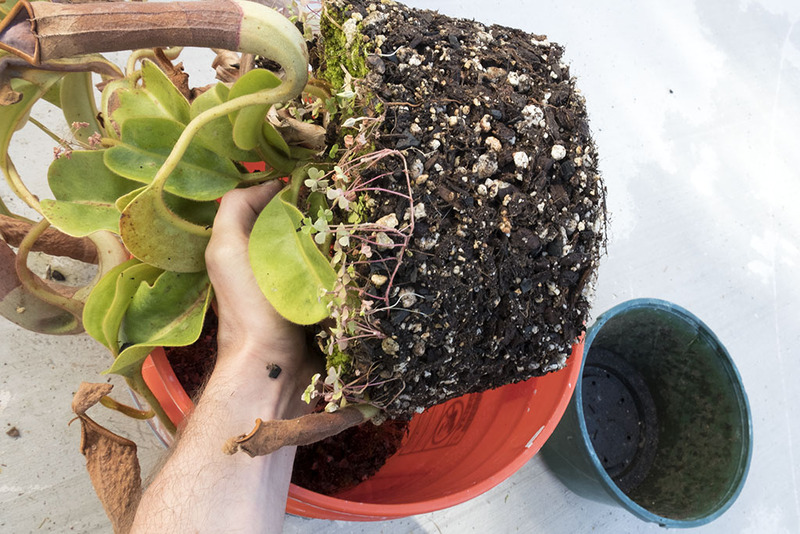 Sometimes a soil reset is the easiest way to weed.If you have weeds, your soil has compacted, or the signs of decomposition are apparent (dark soil that turns to mush when you press it between your fingers), it’s time to re-pot that Nepenthes! What's the best kind of pot for Nepenthes? Is it…a net?…a pot? It’s a net pot! Most plastic pots work just fine, and net pots or orchid pots are super, particularly in high-humidity environments. 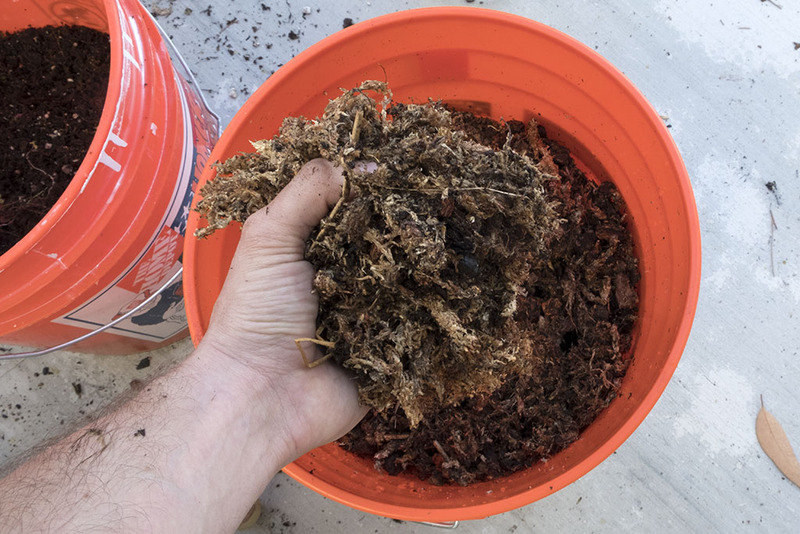 If you use long-fibered sphagnum moss in the soil mix (we’ll discuss soil mixtures, below), it will frequently sprout back to life and you’ll have moss growing out of the side of the pot. This is neat. The copious holes also allow for ample drainage which avoids root rot, and great aeration which cuts down on anaerobic bacteria. 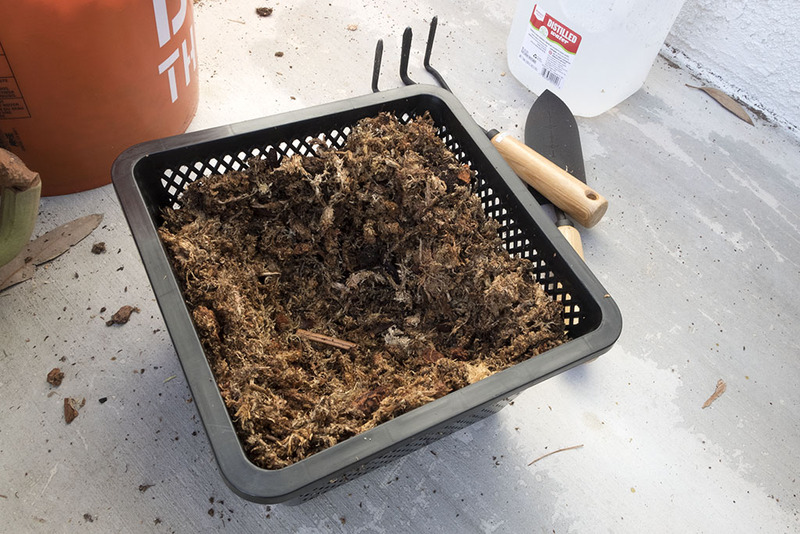 Avoiding decomposition by keeping the soil alive also means you’ll need to change soil much less frequently in the future. Sometimes, you’ll even have a Nepenthes sprout out the side of a pot which is also a cool bonus. Do note that, due to the large amount of soil exposed to the air, water evaporation in net pots is higher than in normal pots, and you’ll need to monitor moisture levels to make sure things don’t dry out.If you want to avoid more frequent waterings, normal bottom-draining plastic pots will also work just fine. 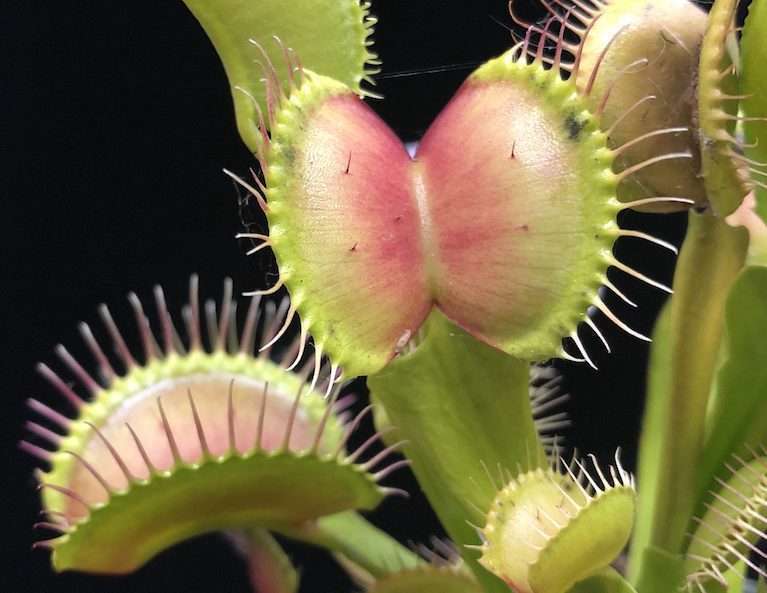 Size-wise, standard 3-gallon pots will be sufficient for most Nepenthes, but you could go with 5 gallons if you have a vigorous grower that sends out frequent shoots (like a N. x ventrata). Double, double toil and trouble! Sphagnum moss grow, and orchid bark… allow for aeration and mimic epiphytic conditions? 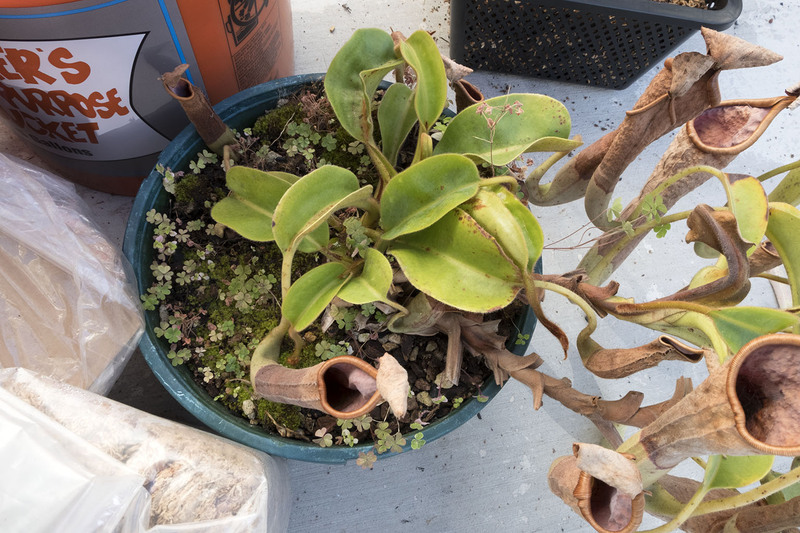 Before you go tearing your Nepenthes from its existing pot, make sure to prepare your workstation, pots, and mix up your soil. 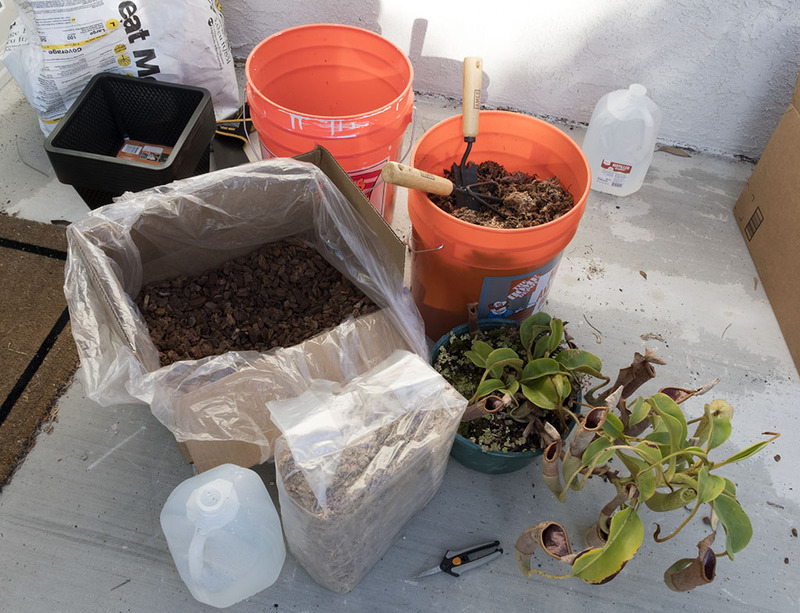 I keep 1-2 gallons of purified water ready, all of my soil components, and 2 large buckets – one to mix fresh soil in, and the other to work over to catch old soil and help me pretend that I’m minimizing the mess.For my Nepenthes soil mix, I eyeball 1 part long fiber sphagnum moss to 1 part orchid bark. I stir this together, attempting to evenly distribute components across the mixture as I add water. 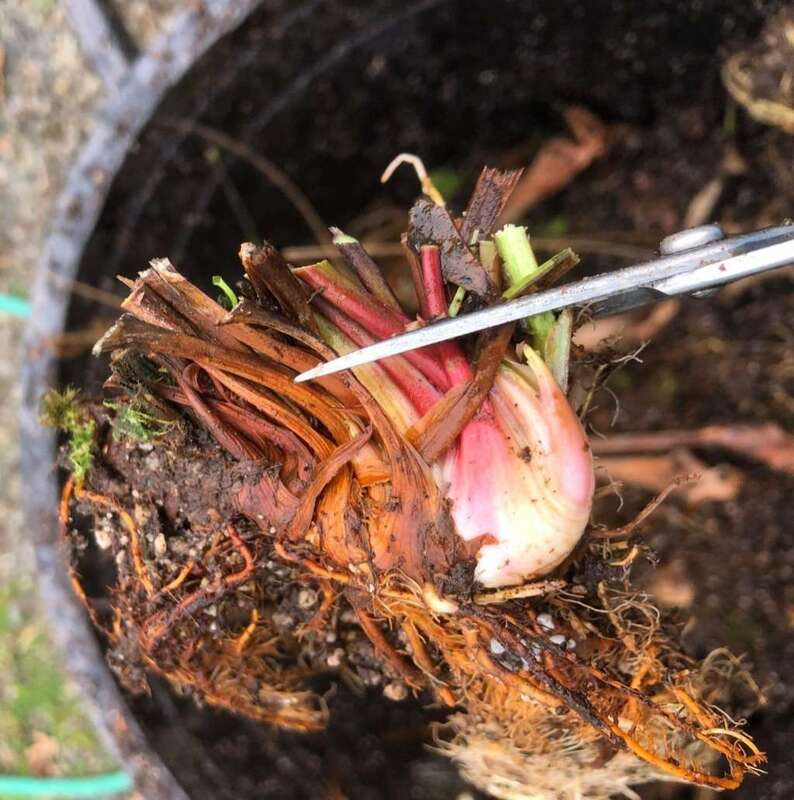 I then take a pot and fill it approximately halfway with the moistened, fresh soil mixture in preparation to receiver those sweet, dangly Nepenthes roots. Nepenthes roots aren’t what I would call fragile, but they definitely aren’t thick and robust, either. Be gentle, but remember that you’re trying to get rid of the old soil, so pick off old chunks even when it clings to your roots. Do everyone a favor, and don’t attempt to photograph the procedure with one hand while shimmying with the other… using both hands makes this a lot easier. 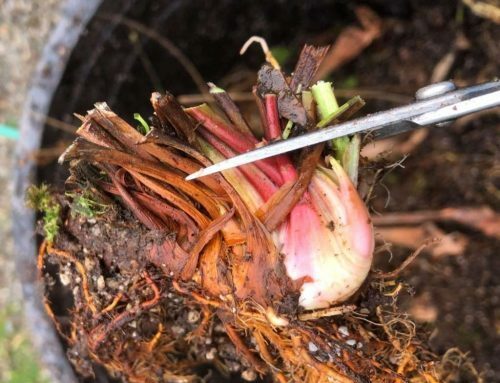 I start by tipping the plant to one side over the soil-catching bucket with my hand firmly at the base of the plant, where the stem meets topsoil. I use this contact as a brace as I shimmy the pot to free the soil. 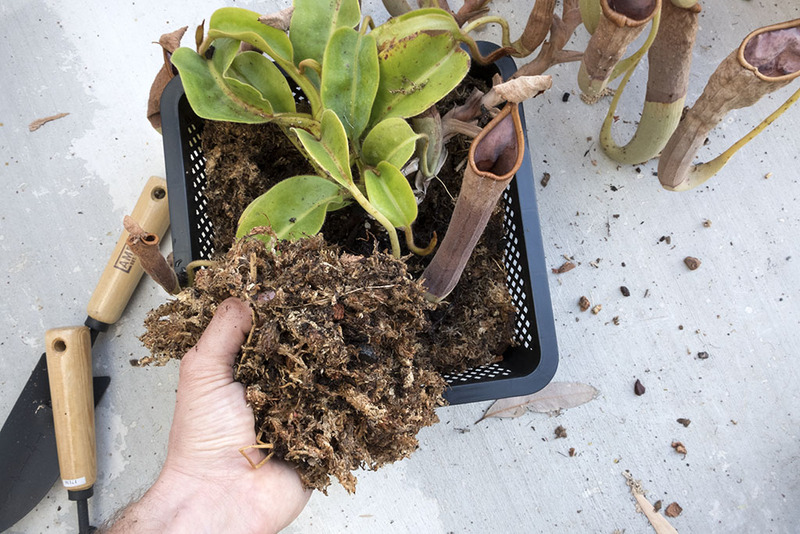 If the Nepenthes is root-bound, there are tons of weeds (as there are here), or the soil has compacted, the soil will come out as one solid clump. If not, you may get loose soil. Loose soil can be messy, so just hover over your bucket. 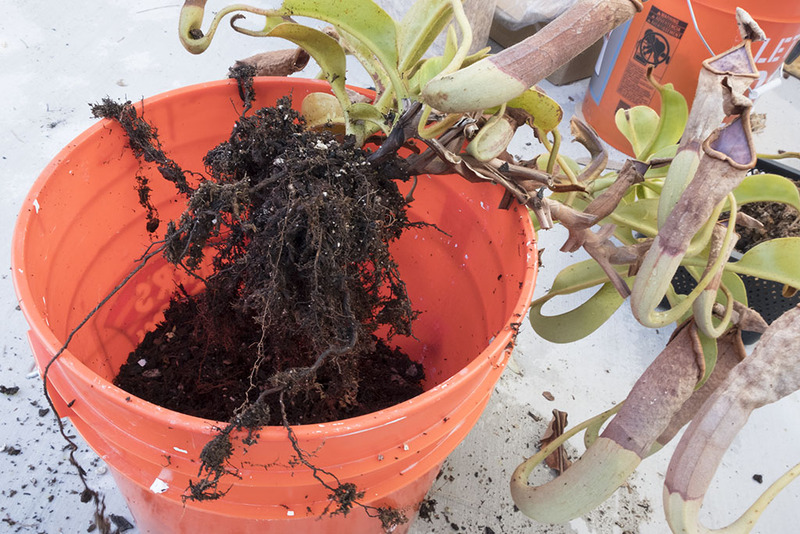 Brush soil free from the Nepenthes roots, and separate out any weed roots. Now, rinse those roots! Go ahead and pour some of your distilled water over them to loosen up and carry away remaining soil.Super! Now you’re ready to re-pot your Nepenthes into the fresh soil mixture. “Wow, hold up, what’s that thing? Is that… a baby Nepenthes? !” If you find yourself saying this, mazeltov! 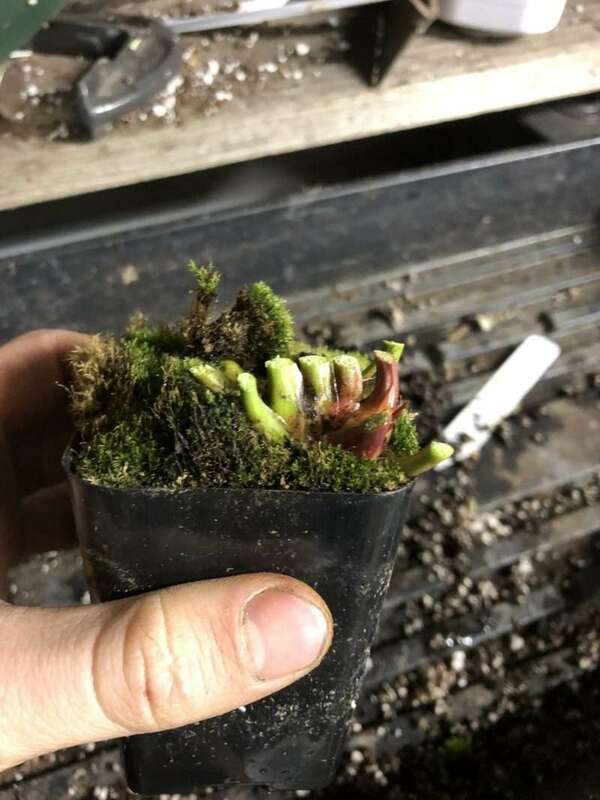 Your Nepenthes is a proud papa/mama (Nepenthes are dioecious – either male or female) and has sent out a shoot that will turn into a full-fledged clone of the parent that it’s attached to.Unlike Sarracenia, I like to avoid tearing apart Nepenthes growth points. Often, new growth points can be traced back to an offshoot on the main plant stem, and they will share the same supporting root system. 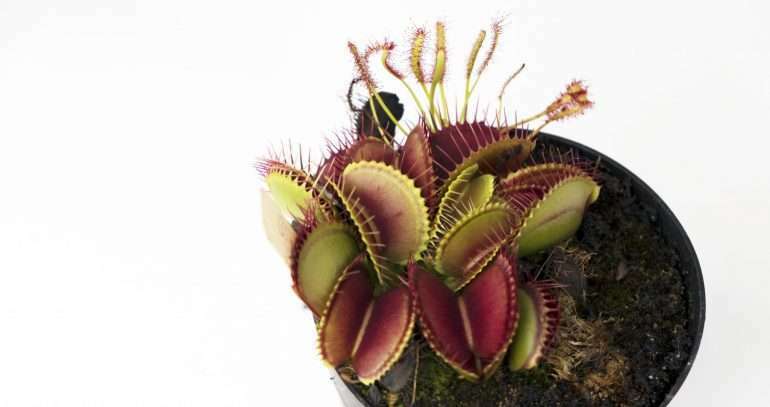 Separating them will leave someone rootless, cause shock to the mother plant and offshoot, and may kill both. 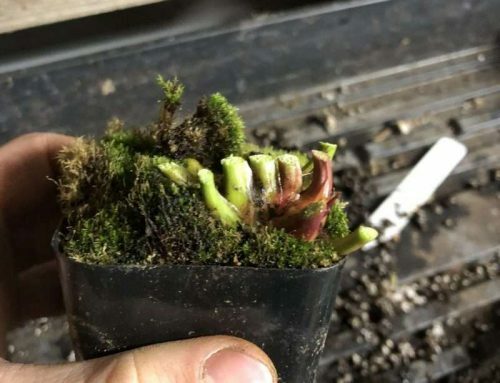 So, fight the urge to amputate/delimb/maul your Nepenthes, and instead, wait for stems to grow nice and long and vegetatively propagate via stem cuttings (which will be covered in another post). It can be good to soak the Nepenthes root system in hormones or vitamins to reduce stress on the plant during the re-potting process. Something like Superthrive can help a plant settle in, establish new roots, and resume vegetative growth faster after being transplanted. 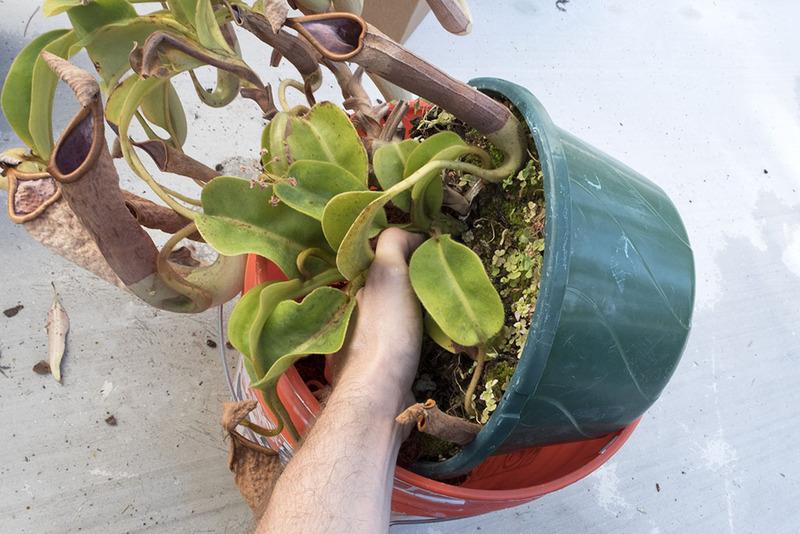 I recommend this step if the plant is very young, very old, or particularly fragile/finicky. Follow the directions on the bottle, and use the lower of the recommended dilutions/dosages. Nepenthes roots are dark brown, especially when wet. Plop that Nepenthes on top of the soil you previously put into your pot, and let’s get dirty! 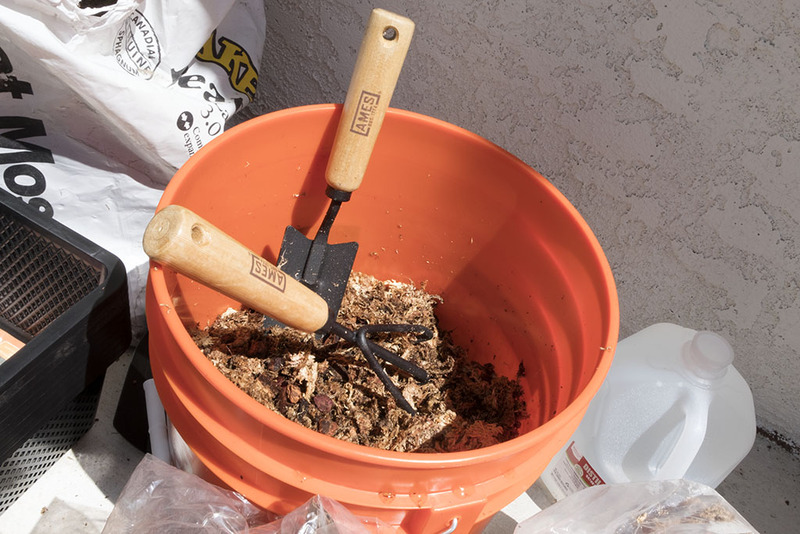 Scoop up your pre-mixed and pre-moistened soil to fill in the gaps up to the top of the pot, and just above the roots. You want the topmost roots to be about an inch below the topsoil, all the way around. Firmly pack the soil so that it makes contact with all roots. Pack soil around all of those leaves. Water your Nepenthes and watch for any soil settling. 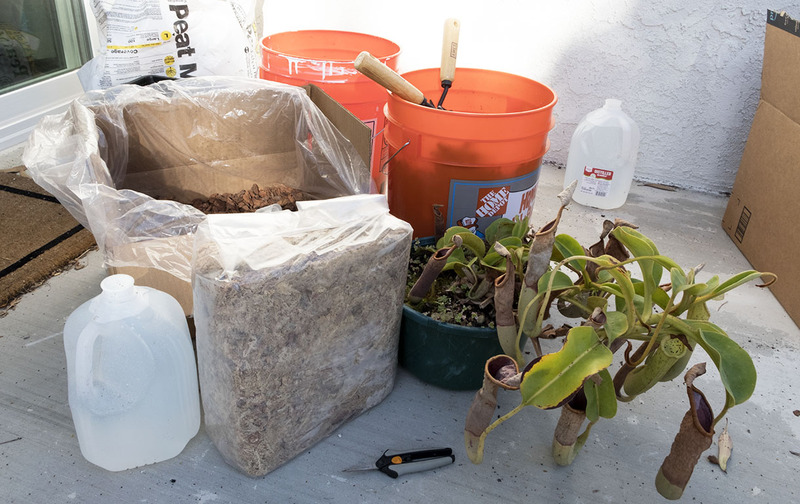 If you see any sinkholes, fill these with more soil and repeat until all roots are buried, all of the soil is firmly packed, and everything is level with the top of the pot. firmly packed and topped-off soil. So fresh. So clean. My nepenthes,which I dearly love, are vigorous growers and I would like to do stem cuttings. Sometimes it works but not always. My nepenthes are growing in my greenhouse and climbing all over the place. I’d appreciate tips for stem cutting culture. 5. Place in bright, indirect light for a 1-3 months, or until you see new growth. At this point, the plant has likely sprouted new roots, and you can repot it into a more permanent home, if needed. I’m working on a more robust blog post on this very topic that I’ll have up before the end of the month.